LAS VEGAS, NV--(Marketwired - Dec 6, 2013) - Last year around this time, "Sandy Hackett's Rat Pack Show" posed the question, "What could be more festive, hip and swingin' than spending the holidays with Frank, Sammy, Dean and Joey?" The show recently wrapped another extraordinary year of touring, but the answer this holiday season is still the same: "Sleigh Bells are Ringin' and the Boys are Swingin' in the Jingle-Janglin' Hit Show, "Someday at Christmas." The longest running show of its kind, with dozens of national and international appearances and multiple touring casts, "Sandy Hackett's Rat Pack Show" (www.sandysratpackontour.com) celebrates with their Yuletide extravaganza (www.sandyhackettsratpackchristmas.com) that incorporates the festive sounds of the season into an entertainment experience that has become a true global phenomenon, seen by more than a million people worldwide. The show, starring Sandy Hackett (www.sandyhackett.com) as Joey Bishop, will be performed at the Tilson Auditorium in Terre Haute, Ind. on December 11 and the McCallum Theatre in Palm Desert, Calif. December 14-15. 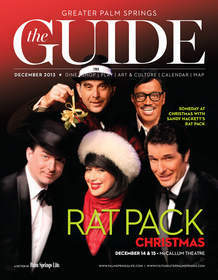 Sandy Hackett's Rat Pack Show's "Someday At Christmas" is featured on the cover of the December 2013 issue of The Guide Greater Palm Springs http://www.palmspringslife-digital.com/palmspringslife/201312?pg=177#pg175 . "Someday at Christmas" is named after the Stevie Wonder song written by show co-producer and star Lisa Dawn Miller's (www.lisadawnmiller.com) father, legendary Motown songwriter Ron Miller. In September, Hackett previewed "My Buddy" (mybuddyhackett.com), an intimate, one man musical comedy show about his father, legendary comedian and actor Buddy Hackett, at the Ice House Comedy Club in Pasadena, Calif. He later performed it at the 900 seat Stocker Arts Center in Elyria, Ohio, ahead of the official premiere of "My Buddy" in January at the Kravis Theatre in West Palm Beach, Fla.
Miller is currently finishing up her latest CD project, "Wasn't I A Good Time," which will feature 16 songs penned by her father -- including new songs discovered after her father's death in 2007. She is also producing and directing a new film documentary on the life and musical journey of her father entitled, "For Once In My Life, The Great American Ron Miller Songbook."